Climate Interactive has many tools that can be used in classrooms from middle school to graduate-level for interactive and engaging classes on topics like, climate change, energy policy, and systems thinking. World Climate is a role-playing climate simulation that gives groups from 6-80 a chance to experience how to negotiate a global agreement to mitigate climate change. 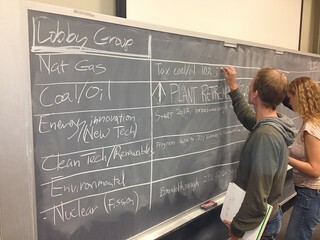 The group breaks into teams that represent different parts of the world and then form proposals to limit climate change to 2 degrees, which are then tested with either the C-ROADS or C-Learn simulations. This is a great way to have groups explore the implications of climate change and the level of response needed to address it. Materials to facilitate the World Climate Exercise are available in several languages here. C-Learn is a simulation that helps people to understand the long-term climate effects (CO2 concentrations, global temperature, sea level rise) of various actions like, reducing fossil fuel emissions, reducing deforestation, and planting trees. It is specifically designed for climate communicators, educators, and leaders of the World Climate Exercise, who want to use a web-based simulation to improve understanding of large-scale actions to mitigate climate change. C-Learn can be found here. C-ROADS is a computer simulation that allows people to explore the long-term climate impacts of policy scenarios to reduce greenhouse gas emissions across up to 15 regions. 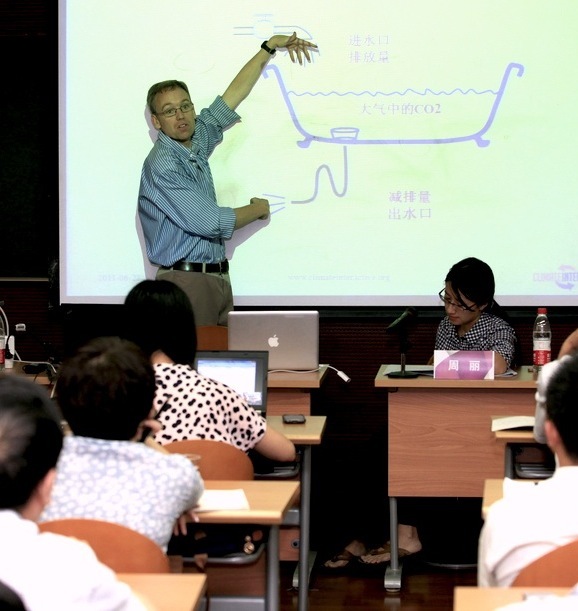 C-ROADS is more technical than C-Learn and is suited for classes studying international climate policy, system dynamics, and works well for analysis in the World Climate Exercise. You can request a download of C-ROADS here. We also have a number of other simulations and animations that are great for exhibiting concepts and using as teaching tools. One popular tool, The Climate Bathtub, includes a teaching guide to help you guide students through the insight it provides. Another, which we are still developing is World Energy, a simulation-based policy exercise using En-ROADS that connects energy investment, energy policy, economic policy, and climate change outcomes. With great results, we recently ran World Energy at Stanford. The Climate Bathtub and the rest of our simulations can be found on our simulations page. If you use our tools in the classroom, please let us know. We are delighted to share resources that educators develop with our community and help deepen our understanding of the complex challenges our world faces. You can reach us at info@climateinteractive.org.